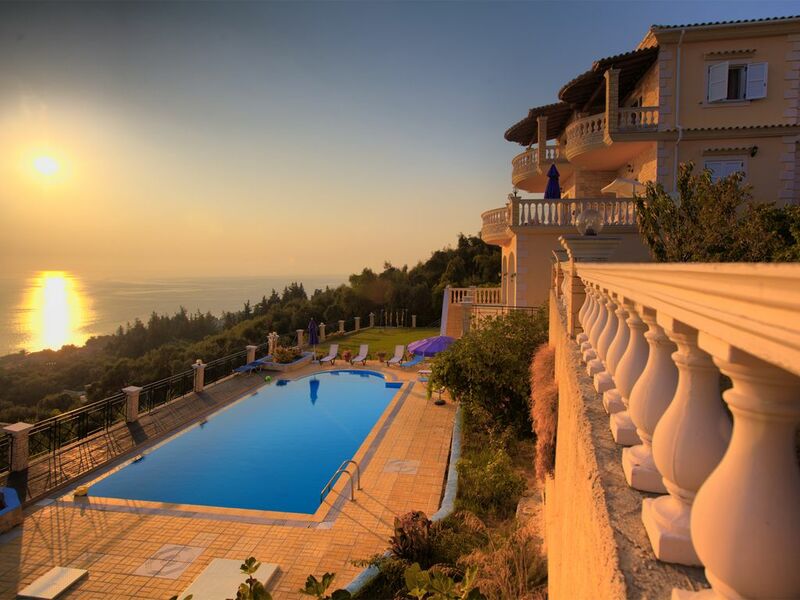 A private luxurious villa in Corfu, with a private swimming pool, parking, garden and panoramic view to the sea. Ideal for family holiday or, generally, for people who seek to rest and relax! The luxurious Villa Panoramic is located at the south west side of Corfu island, 22km away from the city of Corfu and the airport, and only 700m from the magnificent sandy beach of Paramonas. At a 2km distance from the villa is the beautiful and picturesque village of Aghios Mattheos, in which you can find 2 super markets, a butcher’s, a post office, some restaurants / taverns and also some cafeterias at the village’s central road. In the Paramonas region, there is a mini-market just 100m away from the villa. You can find four or five restaurants and tavernas on the beach where you can taste fresh fish and traditional local cuisine. Finally, apart from the Paramonas beach, various other beautiful and clean beaches lie close to the villa, such as Kanouli, Prassoudi, Skidi. At a distance of approximately 20 km from the town of Corfu, in the south-western part of the island, lies the area of Agios Mattheos with the village of the same name. This is an area surrounded by olive groves. The village of Agios Mattheos is situated on a leeward slope of Mount Pantocrator, only 10 minutes away from the nearest beach, that of Paramonas. Villa Panoramic is located at a distance of 450 metres from Paramonas beach and 2 km from the village of Agios Mattheos. There are many sights and areas of unique natural beauty. The Byzantine Castle of Gardiki, which was built in the 14th century, the Palaeolithic Grava Cave, the picturesque chapels in the town of Corfu, Lake Korissia, which has been classified as a biotope, and the historical Pantocrator Monastery with its magnificent view, which is situated at the very top of the mountain of the same name, are only a few of the options available to those who wish to become better acquainted with the area. This villa was well equipped and there was enough space for us to spread ourselves around. The kitchen was small but adequate for a holiday property. The large fridge-freezer were a welcome bonus. The pool was excellently maintained although I was quite concerned about the whole length of the west-facing wall which seems in imminent danger of toppling over. We had an 8-month baby with us and were provided with a cot and high chair. The views from this villa were absolutely incredible and we saw many beautiful sunsets. The villa is situated amongst olive groves but then, most of Corfu is that. Instructions to the villa from the airport could be a lot clearer and the final 200 metres stretch of road leading up to it is a potential tyre buster. Thank goodness for mobile phones because if we hadn’t been able to contact Spiros we would still be going round trying to find the villa. Signposting should be a priority to help new arrivals arrive unfrazzled. Our hosts - the whole family - made us feel very welcome. They were charming and friendly in the extreme and communicating in English was no problem at all. They were keen to ensure we had a good time and kept checking that “everything was ok”. If they repaired the 200 metres of road leading up to the villa, we would seriously consider it. The first time I stayed at this villa was 3 years ago with my husband (our friends invited us to stay) I couldn't believe how beautiful it was, the view from each bedroom is literally breathtaking. With the great big blue sea right in front of the Villa Panoramic which is perched high on the mountain. So perfect, so serene, so dreamy, with an amazing private pool which was kept very clean. There is also a barbecue area. My first thought was that I have to bring my two daughters here to visit, and we finally came with them this May. We had told our daughters all about the Villa, the view, the very charming George who is the villas owners son and the local baker, the local supermarket owners, the local Internet cafe owner who made us feel like we had known them all our lives which made our daughters really want to visit. This was the perfect location for us to visit again as a family. We wanted to spend quality time together away from all the hustle and bustle, living in nature. George's father picked us up from the airport, which is about 30 minutes drive to the Villa, he stopped at the local supermarket so that we could do our food shopping and dropped us off at the Villa kindly explaining how the dishwasher etc worked. We did not rent a car because we as a family love to walk and explore nature and interact with the locals. Half way to the local town there is an area where locals collect natural cold spring water, we did too. We walked about 3 kilometres one way to the local supermarket when we ran out of groceries and the walk was enjoyable making friends with dogs and cats along the way. It does take a bit of stamina to walk downhill and uphill but I think we all left Corfu fitter. The beach is only 10 or 15mins walk downhill from the villa. There is a lovely restaurant near the beach called sunset with great food. George and his family are such genuine and sincere people who will look after you and are there for you 24/7 if you need anything. They are reliable and prompt, all you need to do is give them a call. There is a phone and internet in the villa. One day George brought a lovely homemade Greek dish of a big salad in brown bread and it was delicious. Overall I would highly recommend this beautiful lush place to my friends and family and anyone who wants a taste of paradise. If you are after the "British greece" with all amenities on your doorstep, then this is not the place for you. If you are looking for a slightly remote, peaceful location that you aren't going to want to leave, read on. The villa is owned by a local family, and their two sons. Their friendly and accommodating English speaking son George met us at the airport, and we really did need him to show us the way to this wonderful place. On an unspoilt mountain side location, the villa has stunning views, a private pool, and is peaceful and tranquil. So much so that for our ten day trip we only left for 3 days of excursions. The owners are friendly, hospitable and happy to help, (even bringing us an amazing and delicious home cooked meal one night.) The wi fi is slow but available and the kitchen, though basic, has all the essentials. This IS off the beaten track, local supermarkets have a limited selection of food, but busier tourist areas are only a 20/30 min drive away. The lovely local beach and two traditional restaurants are a refreshing downhill 15 min walk away, but its a steep climb back up to the villa! However the breathtaking views from every room and the pool of the villa are well worth the climb back up from the sea front. A hire car is a must, but get a small one- roads are tiny and the local drivers don't care if the gap is big enough to pass through or not- they just keep on going! We came just after the Greek Euro crisis so most places didn't accept cards but we came prepared with enough cash so that wasn't a problem - there is a small safe at the villa. The family that own this villa own 2 others further down the hillside but this is by far the best. We did have noisy neighbours in one of the other villas but ours had double glazing so they didn't bother us too much. I'm glad we found this hidden gem and we've had a lovely time here and would definitely come again. Our fith rent through HomeAway - And absolut the best without any doubt. We travelled as a couple with our five children. The pictures and description are complete in alignment with reality. The view is nothing but Fantastic. The house has the highest placement on the hillside thus perfect privacy and overview. The pool is very large (app 20*8 meters) and perfectly clean and maintained. The place is unique and in authentic Greek surroundings/atmosphere. Only bad experience was that during our stay the WiFi router broke down, and we had no wi-fi connection for several days and as the place is pretty remote there are no telephone connection working either. The owner did his outmost to fix it and succeded after some days. In general very hospital/friendly owner (a Greek local family: Mother/father and two adult sons who has three houses whereof this is the best - In our oppinion). They are very thrustworthy and really serviceminded and helpful in every way. There are extremely many wasps in the areas - And makes dinner at the terrace very enoying and our youngest son got stong. A tip: If you are a large family buy fresh meat, fish, grocery etc. in big supermarkets in Corfu Town as there are only two very small supermarkets with very limited varity in closest town Agios Mattheos. A perfect place away from mass turism - And small unspoiled beaches on the westcoast. Minor detail: Kitchen and the the outdoor Grill/BBQ lacks a of practical equipment. We can indeed recommend this place. Outstanding property, outstanding service, definitely plan to come back! My wife, son and I couldn't praise this property or its manager more highly; met at the airport, picked up the rental car, and made our way to the western side of the island. Of note: unless you plan on staying in Paramonas, I'd strongly suggest that you consider a rental...even a walk down to the beach and local restaurants is a bit of a steep hike. Great residence with plenty of space. Nice pool, though we didn't use it much because the local beaches were pristine. Personally, I'd recommend staying on the western side of the island to avoid some of the tourist crush; we booked this property because we wanted to get some privacy, and it met and exceeded all of our expectations! We would like to thank you very much for a very pleasent vacation in your wonderfull villa in beautyfull Corfu! It has been a pleasure for our whole family to enjoy your great hospitality in alle the time of our stay in Villa Panoramic in Ag. Matheaos. We got much more than we espected - starting with a nice welcome pick-up in the airport and a nice introduction of the villa. We really feld a warm welcome and very helpfull attetude from the owner, who did all possible, to get us the very best holliday in Corfu. We have had some very good experiences with the people of Corfu - allways very kind and helpfull! LOCATED AT THE SOUTH WEST CORNER OF THE MESIS REGION, AGIOS MATTHEOS IS AN IMPORTANT VILLAGE WITH A POPULATION OF 1500, BUILT ON THE LOWER SLOPES OF THE MOUNTAIN OF THE SAME NAME. FROM THE VILLAGE OF AGIOS MATTHEOS, A ROAD LEADS DOWN TO SKALA, AN EXCELLENT SANDY BEACH WITH SOME SMALL ISLETS OFF-SHORE AND TWO OR THREE TAVERNAS BESIDE THE WAVES.